WALLOPS ISLAND, Va. — An untested commercial spacecraft blasted off on its first trek to the International Space Station today (Sept. 18), kicking off a major demonstration mision for its Virginia-based builders and NASA. The unmanned Cygnus spacecraft and its Antares rocket soared into orbit with a tremendous roar at 10:58 a.m. EDT (1458 GMT) today from NASA's Wallops Flight Facility here — a huge success for the commercial spaceflight company Orbital Sciences Corp., which built both vehicles. The spacecraft is now chasing the space station and is due to arrive early Sunday (Sept. 22), when it will be captured by astronauts using the outpost's robotic arm. The launch was delayed one day due to a technical glitch during the rocket's trip to its seaside pad. But the Wednesday liftoff appeared to go off smoothly, and Cygnus and Antares climbed into a clear blue sky. During the countdown, NASA had to evacuate four homes around the launch area as a safety precaution in the unlikely chance the Antares rocket exploded during liftoff and blew out their windows. Orbital Sciences has been developing the bus-size Cygnus spacecraft since 2008, when NASA picked the Dulles-based company as one of two private spaceflight firms to participate in its Commercial Orbital Transportation Services program. Under that program, Orbital received $288 million to develop Cygnus and Antares. The company later secured a $1.9 billion contract to provide full eight full delivery flights to the space station for NASA using the spacecraft. "This is really a new way of doing business for NASA," said Alan Lindenmoyer, NASA's program manager for commercial crew and cargo. "It is a shared cost. We became an investor and advisor with Orbital." With the retirement of NASA's space shuttle fleet in 2011, the agency is depending on new commercial spacecraft like Orbital's Cygnus to keep the space station stocked with supplies. NASA eventually plans to use private spaceships to ferry American astronauts to and from the space station. Cygnus is the second commercial spacecraft to launch toward the space station for NASA. The first private spaceship to visit the space station was the robotic Dragon space capsule built by billionaire Elon Musk's SpaceX, a company based in Hawthorne, Calif. Unlike SpaceX's Dragon, Cygnus spacecraft are disposable vehicles designed for one-way delivery trips to the space station. At the end of their missions, they will be filled with trash and commanded to burn up in Earth's atmosphere over the Pacific Ocean. The first Cygnus is expected to spend at least 30 days at the space station before being discarded in mid-October. Orbital named the spacecraft the Spaceship G. David Low after a former NASA astronaut who oversaw Orbital's successful bids for its NASA contracts. Low died of cancer in 2008. Built for Orbital by Thales Alenia Space in Italy, the baseline Cygnus model is about 17 feet (5 meters) long and can carry up to 4,409 pounds (2,000 kilograms) of cargo to the space station. A larger version of the craft, called the "enhanced" design, is expected to haul even more supplies. But for this first Cygnus demonstration flight (which Orbital has dubbed the Orb-D1 mission), the spacecraft is carrying just over 1,500 pounds (700 kg) of food, clothing and spare parts to support the space station's Expedition 37 crew. "It is not fully packed for this demonstration mission, but it certainly has some important supplies," Lindenmoyer told reporters here Tuesday (Sept. 17). Culbertson said NASA likely has included a little bonus care package amid the cargo for the space station's crew. "We don't actually open the bags to look at them," Culbertson quipped Tuesday. "But, yes, there are some goodies for the astronauts on board." Today's Cygnus launch marked one unique first for NASA: the first launch to the space station from Virginia's Eastern Shore. The Antares rocket carrying Cygnus lifted off from Pad 0A at the Mid-Atlantic Regional Spaceport, a commercial spaceport operated by Virginia Commercial Spaceflight Authority at NASA's Wallops Flight Facility. NASA officials were expecting nearly 1,000 people at the Wallops facility to watch the launch, with thousands more expected to see the launch from nearby viewing sites and along the U.S. East Coast. Today's launch comes on the heels of Orbital's spectacular night launch of NASA's LADEE moon probeon Sept. 6, which amazed spectators as far north as New York City and even Maine. The recent launches are drawing larger crowds to the area, spaceport officials said. "I see it as nothing but positive," spaceport director Dale Nash told reporters Tuesday. "People complain about the traffic, but that's okay." 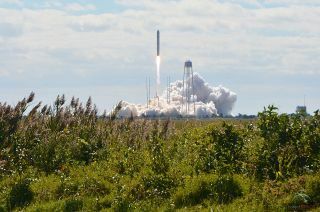 SPACE.com is providing complete coverage of Orbital's first Cygnus test flight to the International Space Station. Visit SPACE.com for updates on the mission. SPACE.com partner Spaceflight now is also offering updates via its Cygnus Mission Status Center, which will also include a launch webcast. Editor's Note: If you snapped a photo of Orbital Sciences' Antares rocket streaking toward space, or any other amazing sky view that you'd like to share for a possible story or image gallery, send photos, comments and your name and location to managing editor Tariq Malik at spacephotos@space.com.